An international team of scientists from the Jodrell Bank Observatory in the UK and from Australia, Italy, India and the USA have announced in today's issue of the journal Science Express [ 8th January 2004 ] the first discovery of a double pulsar system. They have shown that the compact object orbiting the 23-millisecond pulsar PSR J0737-3039A, which they reported previously [Nature 4th December 2003], is not only, as suspected, another neutron star, but is also a detectable pulsar. The companion, PSR J0737-3039B, is rotating once every 2.8 seconds and orbits PSR J0737-3039A in only 2.4 hours. Both stars in this remarkable binary system have masses greater than that of our Sun, but are only 20km across and have an orbital separation which is less than the size of the Sun. Professor Andrew Lyne of the University of Manchester points out that "While experiments on one pulsar in such an extreme system as this are exciting enough, the discovery of two pulsars orbiting one another will allow us to undertake precise new tests of general relativity and to probe energetic physical processes that occur in the magnetosphere, or `extended atmosphere', of a neutron star." The 23-millisecond pulsar was first detected in April 2003 using the 64-m Parkes radio telescope in New South Wales, Australia. Subsequent observations were made both at Parkes and with the 76-m Lovell Telescope of the University of Manchester's Jodrell Bank Observatory in Cheshire. Already, four different effects beyond those predicted by Newton's laws of gravity have been measured and are completely consistent with Einstein's general theory of relativity. Dr. Richard Manchester of the Australia Telescope National Facility says "The fact that both objects are detectable as pulsars enables completely new high-precision tests of gravitational theories. This system is really extreme." Future observations of the two stars will measure their slow spiral in towards each other as they emit gravitational waves - a dance of death leading to their ultimate fusion into what may become a black hole. 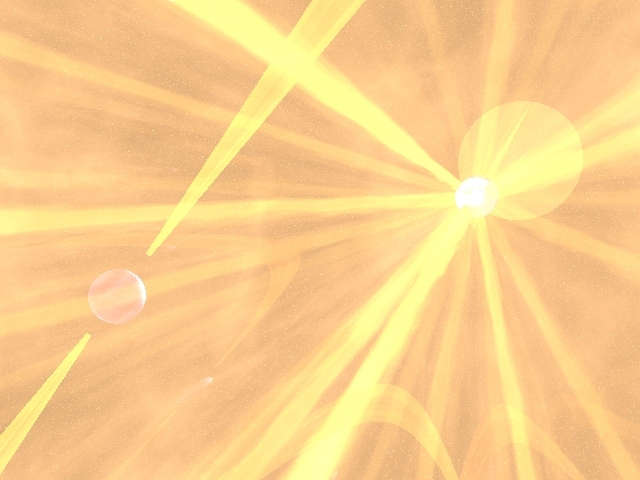 The stars will coalesce in only approximately 85 million years, sending a ripple of gravity waves across the Universe. The discovery of the system shows that such coalescences will occur more frequently than previously thought. "The news has been welcomed by gravitational wave hunters, since it boosts their hopes for detecting these elusive signals." says Prof. Nichi D'Amico of Cagliari University. General relativity also predicts that the two stars will slowly wobble like spinning tops. Future observations of this "precession" will allow new tests of Einstein's theory. 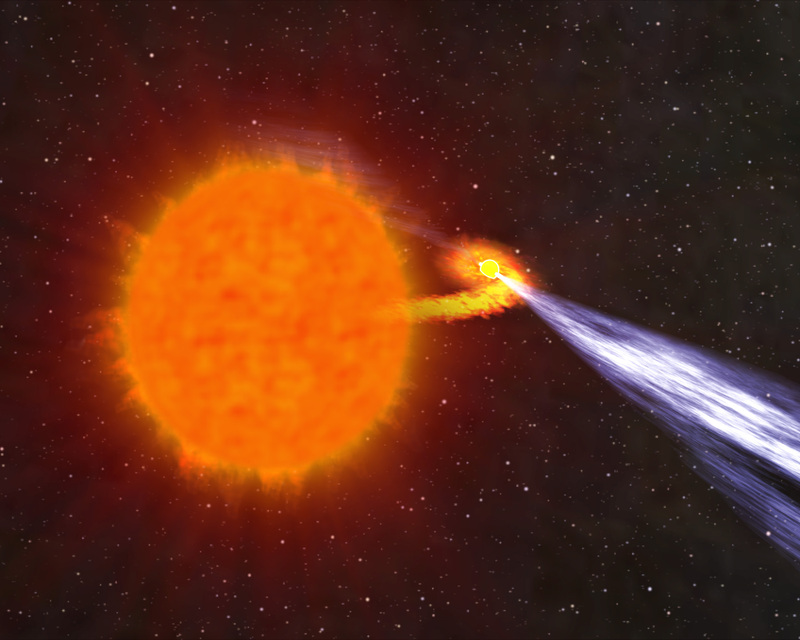 "This effect will ultimately shift the pulsars' beams out of our line of sight, making them undetectable", explains Dr. Michael Kramer of the University of Manchester. Another unique aspect of the new system is the strong interaction between the radiation from the two stars. By chance, the orbit is seen nearly edge on to us, and the signal from one pulsar is eclipsed as it passes behind the other. This provides a unique opportunity to probe the physical conditions of a pulsar's magnetosphere, something has never been possible before. The pulsar surveys responsible for this discovery have used "multibeam" receivers built at the Jodrell Bank Observatory and have used the Parkes Telescope and Jodrell Bank's Lovell Telescope for observations. They have been extraordinarily successful, discovering over 700 pulsars in the last 5 years, nearly as many as in the preceding 30 years. The discovery of this new binary system has been one of the "holy grails" of pulsar astronomy and will provide a wealth of astrophysical information for years to come. A.G. Lyne, M. Burgay, M. Kramer, A. Possenti, R.N. Manchester, F. Camilo, M.A. McLaughlin, D.R. Lorimer, N. D'Amico, B.C. Joshi, J. Reynolds and P.C.C. Freire. 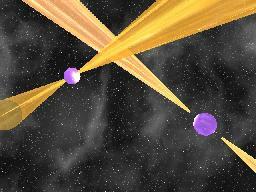 "A Double-Pulsar System - A Rare Laboratory for Relativistic Gravity and Plasma Physics". A pulsar is the collapsed core of a massive star that has ended its life in a supernova explosion. Weighing more than our Sun, yet only 20 kilometres across, these incredibly dense objects produce beams of radio waves which sweep round the sky like a lighthouse, often hundreds of times a second. Radio telescopes receive a regular train of pulses as the beam repeatedly crosses the Earth so the objects are observed as a pulsating radio signal. Pulsars make exceptional clocks, which enable a number of unique astronomical experiments. Some very old pulsars, which have been "spun up" to speeds of over 600 rotations per second by material flowing onto them from a companion star, appear to be rotating so smoothly that they may even "keep time" more accurately than the best atomic clocks here on Earth. 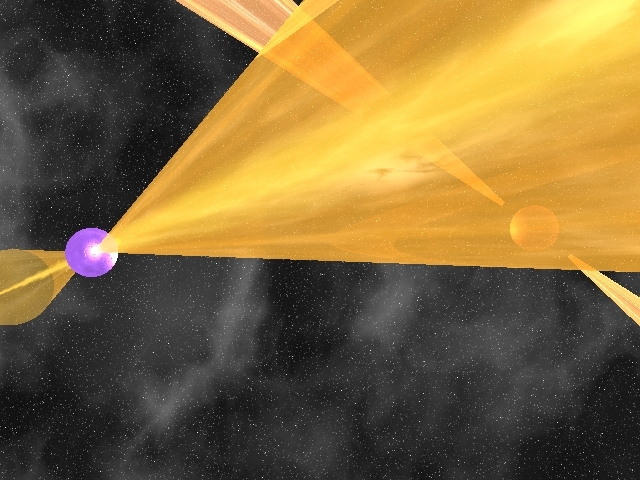 Very precise timing observations of systems in which a pulsar is in orbit around another neutron star have been able to prove the existence of gravitational radiation as predicted by Albert Einstein and have provided very sensitive tests of his theory of General Relativity - the theory of gravitation which supplanted that of Isaac Newton. The neutron star binary system reported in this paper is one of these systems, with an orbit which is decaying more rapidly than any previously discovered. 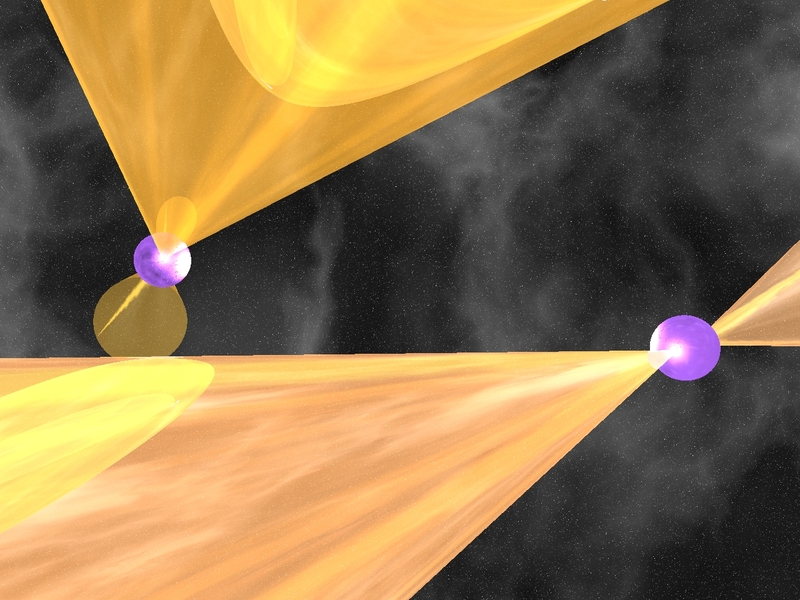 The Parkes survey using a multi-beam system that led to the discovery of the double-pulsar system is an international collaboration of a team of astronomers from the UK, Australia, Italy and the USA. The researchers have been surveying our Galaxy, the Milky Way, for new radio pulsars using the 64-metre Parkes Radio Telescope in New South Wales, Australia. The powerful new "multibeam" receiver was built as a joint venture between engineers at the Australia Telescope National Facility and the University of Manchester's Jodrell Bank Observatory. The receiver gives the telescope 13 beams capable of scanning the sky simultaneously and, as Professor Andrew Lyne of the University of Manchester explained, "It's like having over a dozen giant radio telescopes operating at once". As a result, the system requires 13 sets of sophisticated data acquisition systems, one for each beam, which were largely developed and built by the UK group. 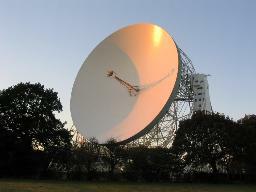 Following initial detection at Parkes, confirmation and follow-up observations for many of the new pulsars are made with the 76-metre Lovell Radio Telescope at Jodrell Bank. 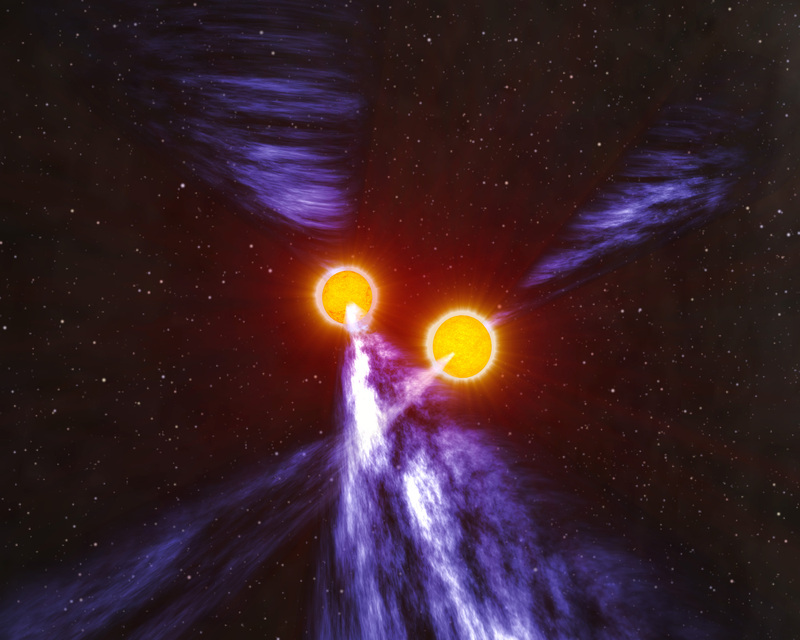 The main processing of the survey in which the PSR J0737-3039 system was discovered was conducted on a cluster of computers at Cagliari Astronomical Observatory.